12 Video Repair Software: – Whoever wondered that there will be a time when we can record videos at home and view it on the television or laptop, or can even download our favorite videos online? So, now that is eventually possible, we have other issues to handle related the video codecs. It may so happen that you have videos in .mpeg or any other format and that is corrupted, hence does not play properly. It may freeze while playing, break or may not run at all. There can be various reasons behind the failure of the video which can be resolved with only video repair tools that help mend any corrupt video easily. You know you are safe when there is an alternative available to the video such as, buying the movie from the shop, however, if it’s something that you have recorded personally and is corrupted now, it can get tough. Hence, you require a video repair software to take care of your corrupted files that can fix them for a hassle free viewing experience. Today, we have a list of free video repair software that can help fix the corrupted video in no time. While some of these softwares work for only certain codecs, some work for all. These freewares fix different formats like, MPEG, AVI, WMV, MP4 and many other frequently used codecs. So, check the list and make your choice based on the format of your corrupted file. Very few of us may know that VLC Media Player which is one of the leading applications to play video and audio files, also helps repair damaged video files in MP4, MOV, AVI and QTRM formats. So, for all those who did not know this amazing feature of VLC Media Player, we will tell you how to go about it. You simply need to go to “Tools” => select “Preferences” from the drop-down. Now, a window will open where need to find and click on “Inputs/Codecs” option. Scroll down the sidebar and identify the section that says “Damaged or incomplete AVI file”. This has a drop down from where you need to select “Always Fix”. Now save your preferences and play the video error free. Now, a window will open where need to find and click on “Inputs/Codecs” option. Scroll down the sidebar and identify the section that says “Damaged or incomplete AVI file”. This has a drop down from where you need to select “Always Fix”. Now save your preferences and play the video. If its corrupt VLC will fix it. However, your video is severely damaged and cannot be fixed even by the VLC Media Player, you can then seek help from any other video repair software that are listed below. Your hunt for the impeccable video repair software may just end with DivFix++, especially if your video is of AVI format. There are quite a few things that we like about this software; firstly it’s free of cost, then it fixes damaged AVI files and finally, you can also exclusively preview any partially downloaded movies from torrent, ftp.web, ed2K or from any other internet sources. Using the preview feature you can also ensure that the video file name is the same as the actual video. Using DivFix++ is also very easy, as you simply need to open the video file you want to repair or instead drag-and-drop the file into the software’s interface. For adding the files manually, you need to select “Add Files” and add a video to the list for repair. What is exciting here is that the software also helps repair more than one AVI files at a time, so you just need to choose the option “multiple AVI files” and add them in the repair list. Now, you can select “Strip Index” tab to delete the index section from the video and then select the “Fix” option to start repairing the file. You can run a quick check on your file with the “Check Errors” option. You can also choose to cut out any damaged sections of the video by clicking on the “Check Out Bad Parts” option. If you do not want your original video files to be overwritten, select “Keep Original File” option. Available to download for free, Digital Video Repair is another video repair software helps overhaul your corrupt AVI video files which are encoded with MPEG4, DivX, Angel Potions, Xvid and 3ivx. This software helps fix AVI files that experience rough playback, visual disturbances, or any disruptions in the audio or video quality, and thereby re-encodes corrupted segments to ensure a smooth viewing experience while retaining the original detailing of the AVI file. It helps identify the damaged files, fixes the AVI file index and files over 2GB size, repairs AVI files that broke down while recording, identifies the key-frames of different codecs viz. MPEG4, DivX, Angel Potions, Xvid and 3ivx and reconstructs the files without the MOVI-chunk. The application supports OpenDML AVI and Standard AVI file compositions. Also, supports multiple languages through the system menu like English, German and Russian. For the fixing process, select the option “Input File” and add the damaged video to the software interface. Here, you can check for any errors by clicking on “Check Errors” that is detectable by the software. 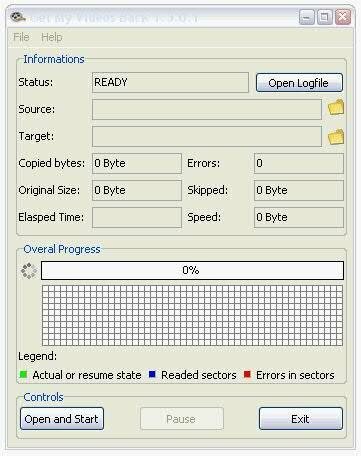 Any error detected will show on the “File Status” and then you can select “Repair” for the fixing process to start for the video file. Post the repair, you can select the destination folder where you want to save the video. You can now see the “Status” of the repair process that shows on the graphical user interface which you can save to your desired location in the computer. Basically, MP4 Video Recovery Tool follows the original video as reference, gets the data and then reconstructs the damaged video. Don’t you feel frustrated when your DivX file just refuses to play due to damaged video file? DivXRepair helps you to fix damaged AVI format video files in your device effortlessly. While it repairs the broken video, it also repairs other concerns like freezing of images, pixel discoloration, and loss of audio. You simply add the damaged files to the list that you want to repair and the software will automatically trace and delete the corrupted frames. You will have to be patient as the search procedure does take some time. Even though it may not detect all the bad frames at all times, but when it does, it efficiently repairs the damaged section for you to have smooth viewing experience. It eliminates the damaged portion and re-attaches the disconnected parts together to ensure that the video functions properly. The best part is that you can also select multiple files to fix videos in bulk. Once the repair process is over you will see a pop-up that displays the final report and which comprises of the video repair information. One of the easiest video repair software, DivXRepair comes with an equally simple user interface that’s extremely easy to navigate. You got a scratched CD or a DVD lying around? Get your video back from these damaged media devices with this free tool “Get My Videos Back” effortlessly. While restoring the damaged videos is super easy, this software also offers a lot of additional features such as, no restriction on the file size, estimating the flaws and size of the skipped data, counting the skipped data using Disk type, providing pause enabled copy, checking how much free space is available on the target drive, assisting in continuation of report, and the ability to save each of the readable byte using byte mode. Therefore, in order to have those corrupted video files reported, you need to click on the “Open and Start” option. Select the damaged video file that you want to be repaired, and then you will be asked to choose a target folder. The moment you select the target folder, the video fixing process begins. The best part is that Get My Videos Back can repair most of the video codecs that is, DivX, FLV, MP4, 3GP, AVI, MPEG and more. 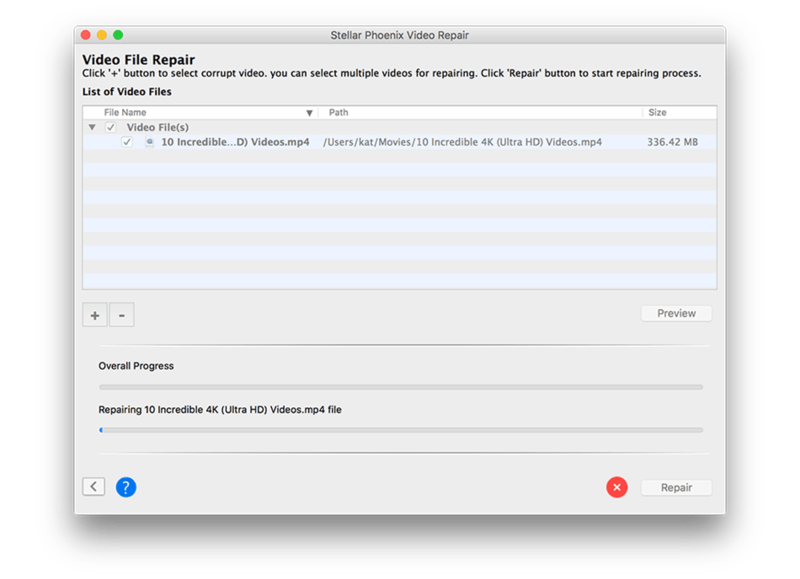 Targeted for the Mac platform and its latest update, Stellar Phoenix Video Repair is a software that aims to fix corrupt video files. This tool also repairs MOV files that have stopped playing on Quick Time player due to breakage apart from videos in other formats like, F4V, M4V, MP4 and M4A. It aims to repair any major concerns related to the video such as, audio breakage, format change, time lapse, fault with the header and movement error. That’s not all, as this tool also lets you add multiple video files for repair at the same time. Among its other features are its ability to fix the video files on storage media devices, memory cards and hard disks, enabling you to preview the fixed video files, and storing the repaired videos at your desired destination folder. 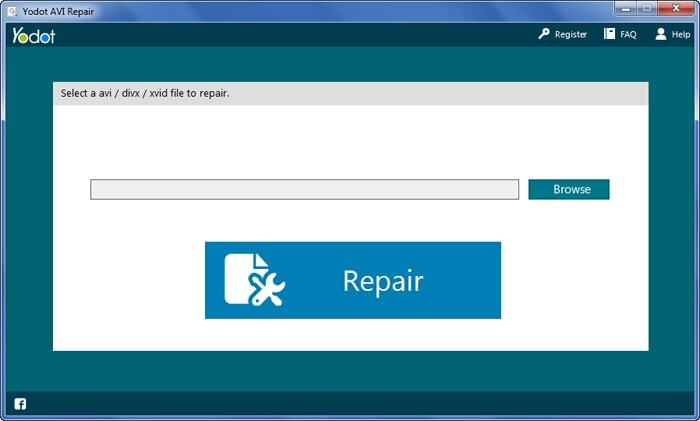 The free demo version allows you to preview repair videos up to 10MB. However, you cannot preview F4V video files under the default viewer in Mac as it is not supported by Quick Time. Stellar Phoenix Video Repair offers a neat and user-friendly interface that does not require you to be an expert to use it. With just a few clicks of the mouse, you can complete the repair process. Yodot AVI Repair is specifically developed for the Windows and Mac operating systems that help repair video files in XVID, DIVX and AVI formats in a flash. Not just that, it helps repair AVI files created by the well-known DSLR cameras or camcorders, fixes videos files in AVI format sitting in the memory cards, USB devices, hard drives, etc., and lets you preview repaired video files. Apart from AVI files, Yodot AVI Repair also fixes video files with XVID and DIVX video codecs created by several multimedia devices that include mobile phones and digital cameras. In order to use the software follow the simple instructions on the displayed on its screen. As soon as you add the desired video file that you want to repair, the program starts repairing the file. On completion of the repair, it shows report log along with the file description. Now, you can preview the AVI file if it has been successfully repaired and once satisfied save the repaired video file in the desired destination folder. The program comes with a simple and easy to use interface. As the name suggests, you can repair video files in AVI format along with DivX and XVID files with Remo Repair AVI and makes sure that you can play the damaged video files error-free post the repair process. Additionally, this tool fixes and affixes sound and visual data stream parallel to each other, repairs AVI files that are playable both on the Mac and the Windows operating system, available in free demo version that fixes damaged files and even allows you to preview the repaired output enabling you to analyze the program before you proceed to purchase, and supports several multimedia devices like, memory cards, USB drives, hard disks and more. In order to repair your corrupted video files, start the software on the main screen and chose the video files from the list that you want to repair. The evaluation of the selected video files begins instantly and the repair process then follows. On the successful fixing of the file, you will see a prompt with an option for you to preview the repaired file. Once you have previewed the fixed file and you are satisfied with the output, you need to register the software so that you can use the repaired file. Finally, save the file to your desired location. Remo Repair AVI comes with a straightforward and easy to use interface that helps you to repair your files in just a few mouse clicks smoothly. If you have piled up those partially corrupted or damaged video files, do not trash them as of now as you have Repair Video Master to restore them for you. 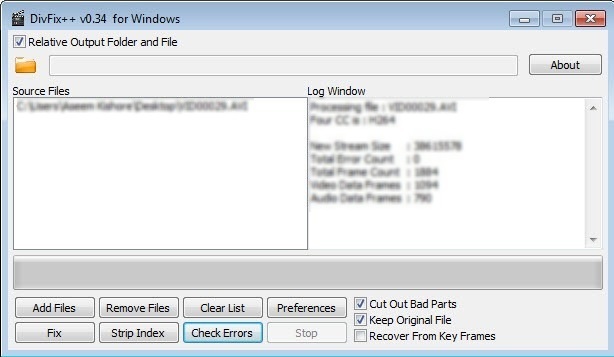 It is a compact tool developed for Windows OS and aims to recover damaged video files that are unplayable or fast forwarded. What’s best about this small tool is that despite it’s size, it can repair video files in multiple formats like, AVI, DivX, Xvid, MPEG-4, RM, RMVB, ASF, WMV, WMA, AC3. Above all, the software retains the original video quality and ensures no damage to the same and rather creates a separate restored or repaired video file. It repairs the files with magnificent speed and impeccable performance. Repair Video Master fixes files that are unplayable, trimmed, corrupted, broken, damaged in some form, that are unable to copy from CDs, DVDs or other media sources completely, that are frozen while playing, that fail to rewind or fast forward and for those files where the play button doesn’t work. You can get multiple files repaired at a time with Repair Video Master and it supports big sized video files that are larger than 2GB. You can also get delete not important details from AVI file. It comes with a handy interface that’s easy to navigate. 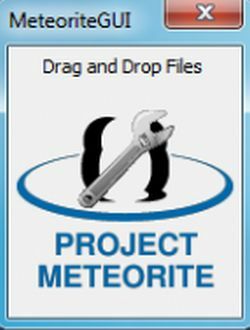 An open source project that is designed to fix corrupted MKV video files, Meteorite can also repair MKV files that are in the process of download online. It comes with an extremely basic layout and does not really have an interface. When you download this software, it merely opens in the form of box with literally no options. However, the solace here is that it offers a drag-and-drop option, so you can simply drag the MKV video files you want to repair and drop it in the box. The software then automatically begins the repairing process, deletes the damaged files and places the repaired one. Meteorite is evidently the first and only dedicated MKV repair software, operates on C++ coding for swift function and supports several OSes. File Repair is a unique tool that not just repairs video files efficiently in most of the formats, but also supports other file formats like, DOCX, XLS, ZiP, RAR, JPEG, GIF, PNG, PDF, PPT, MP3, WAV, etc. The utility scans the corrupted file and gets out as much data as it can from it to create a file that is playable. 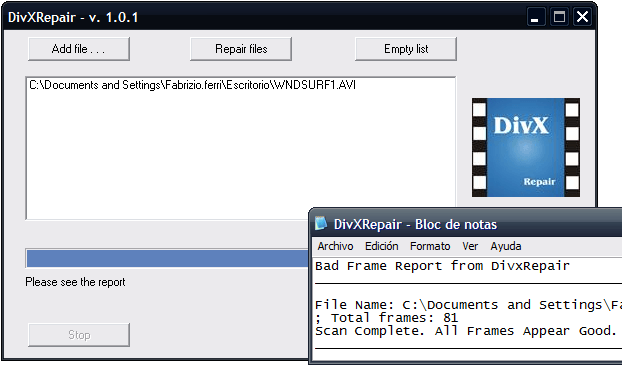 Select the damaged file from the list on the user interface and click on the option “Repair”. You can see the entire process in the log screen located beneath the browser. Once the repair process is complete the original video file is reinstated with the repaired video file. Apart from video files, File repair also fixes damaged word docs, excel spreadsheets, ZIP or RAR archives, images of JPEG, GIF, TIFF, BMP, PNG or RAW formats, PDF documents, Access databases, PowerPoint presentations and music files. Yodot isn’t free. It’s free to try. HERE IS MY PROBLEM! I did transfer all the videos (MOV format from Iphone) in a USB. Then, when I copied back in the laptop they looked corrupted and I couldn’t open or play with different software like media player, vlc, converting software…. This happened with that usb before. It was new one, with not any software in it. I don’t want to pay for any software without being sure it will work out. Any suggestion? Thank you! What software can repair horizontal banding lines on mac?